its biological properties; the action of the microflora, of plants. Therefore, the purification system is constituted by both the soil and the crops. Some pollution elements are discharged to the atmosphere: part of the carbon is converted into carbon dioxide through bacterial and plant nocturnal respiration. Other pollution elements are injected by plants: first, C and N, followed by P, K, Ca, Mg and to a lesser but potentially dangerous extent, heavy metals. The three main soil treatment modes are irrigation, infiltration-percolation and regulated run-off (figure 42). Table 15 provides the characteristics and normal performance levels applicable to these treatment systems. Irrigation is the most widely used system. However, in most countries, it is becoming more and more regulated in terms of the types of effluent that can be spread (please refer to health risks for agricultural workers and consumers).Water is brought in through a channel or applied by spraying (warning: danger of spreading pathogens).The water table must not be less than approximately 1 m deep. Soil permeability must be moderate and drainage is frequently recommended. The amounts of water used will obviously vary depending on the type of crop, the nature of the soil and climactic conditions. 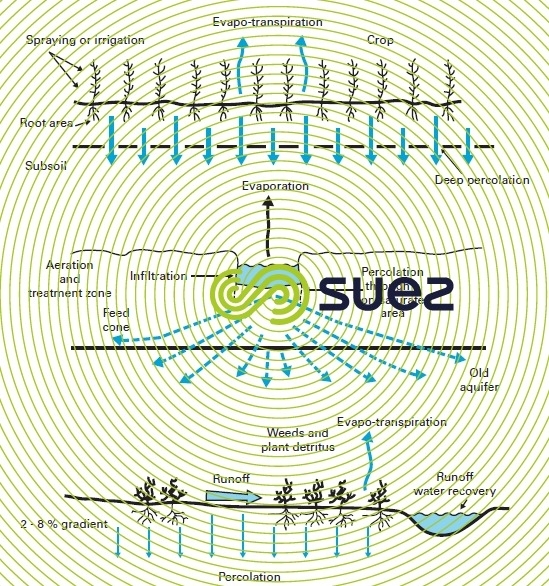 Infiltration-percolation systems have been developed over recent years, making use of wastewater produced by small communities or local authorities (infiltration bed after a brief pre-treatment, after primary sedimentation, after bacteria bed).The systems also vary considerably in terms of the ground area covered. The more thorough the upstream treatment, the smaller the ground area covered. Contact time will vary from 0.5 to 6 days. The main advantage of this system is that it simplifies excess sludge management to the absolute maximum. For instance, in the case of the Rhizopur process (bacteria bed + infiltration), sludge extraction is only carried out every 5 to 7 years. Filters planted with reeds constitute a variant of this system. Beds made of filtering matter are planted with reeds that mainly aerate and unclog the filtering bed. 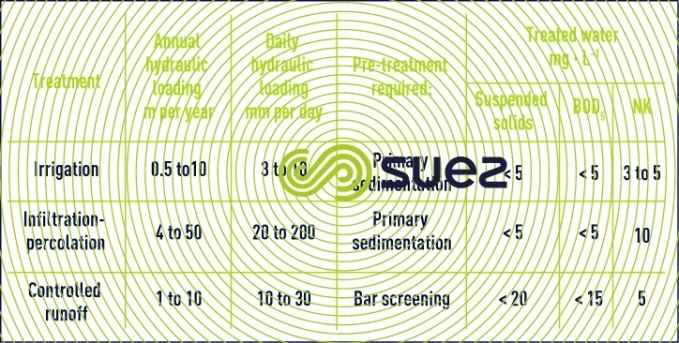 Used in primary treatment in small communities (1 to 1.5 m² per p.e.) and in secondary treatment (0.5 to 0.8 m² per p.e. ), treatment levels ensure that D4 level standards are satisfied. There are vertical flow filters (which tend to be used for primary treatment) and horizontal flow filters (for secondary treatment).Cleaning is carried out approximately every 10 years. At that time, the bed's surface layer has to be replaced.